Have you the voice to deliver new Dunfermline guided tours? Tourism bosses are holding auditions for The Voice of Dunfermline on Thursday. And while will.i.am or Sir Tom Jones might not be swivelling around in their chairs to salute the lucky winners, the prize of promoting the town to the wider world is not to be sniffed at. Organisers at ONFife Cultural Trust are searching for people to help them put on a programme of free daily walking tours this summer and are inviting candidates to send in recordings of themselves singing the town’s praises or to go along to Thursday’s auditions. The project is supported by Carnegie Dunfermline Trust and Dunfermline Delivers with Scottish Enterprise funding. 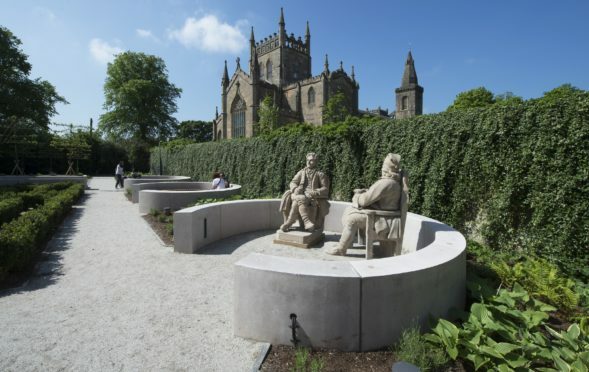 The walks will be led by people of Dunfermline who love their town and want to share its amazing stories. Guides will receive extensive training on public speaking and leading groups and will also help collate the content of the new digital tours. In the same way the TV talent show The Voice uses blind auditions, the organisers are collecting tapes online and in person this month in the hope of recruiting the right volunteers. The opportunity is open to everyone over 18 with a passion for the town. It is hoped training will start later this month and the project aims to recruit a further 20 people later in the year when the tourist season is in full swing. To audition, people are invited to send a voice recording explaining what they love about Dunfermline or what makes them feel happy or proud about living there. The recording, which should be five minutes long and in .mp3 format should be sent to DunfermlineTours@gmail.com by midnight on February 14. Open auditions will also be held in the Kingsgate with 12 slots available from noon to 2pm on February 14. Email mark.macleod@onfife.com for further details of how to send a file or to book a slot. The 20 entrants who are judged to be the most passionate and enthusiastic will be invited to the first training programme. Ian M Wilson, chairman of Carnegie Dunfermline Trust, said: “This is an innovative recruitment campaign and is aimed at bringing a diverse range of new ambassadors to promote the town.